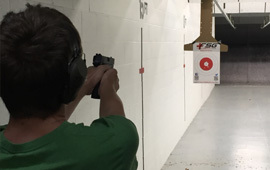 This is a 2 day course to become an NRA Instructor for Basic Pistol Training. During the course candidates will learn NRA policies and procedures; basic public speaking skills; training methodology; use of a training team and training aids; organizing a course, building a budget; and finally preparing to teach. In addition, candidates will be provided the appropriate lesson plans and basic course student packets. Role-playing is a major part of an instructor course. Candidates take turns working in teams, actually conducting portions of the course to other candidates who portray basic students. Instructor training courses are conducted by NRA Training Counselors . Training Counselors are active and experienced instructors who have been certified by NRA to train experienced shooters to teach others to shoot. Training Counselors will evaluate candidates' performance based on their ability to handle the firearms with confidence, use of appropriate training aids, following the lesson plans and meeting all learning objectives, while utilizing the teaching philosophies expected of NRA Certified Instructors. Candidates can also expect to learn the NRA discipline specific instructional methods and evaluating and improving the performance of beginning shooters. Candidates must have completed the NRA Basics of Pistol Shooting. MUST be the Instructor Led Course. Blended Online Course does not qualify. Candidates must possess and demonstrate a solid background in firearm safety and shooting skills acquired through previous firearm training and/or previous shooting experience. Instructor candidates must be intimately familiar with each action type in the discipline for which they wish to be certified. Candidates will be required to demonstrate solid and safe firearm handling skills required to be successful during an instructor training course by completing pre-course questionnaires and qualification exercises administered by the NRA Appointed Training Counselor. Lunch and Drink. You will also be given a break to go to a fast food restaurant. Our IL CCL classes & instructors are approved by the Illinois State Police. Our training courses meet and exceed the state of Illinois training requirements, which are required to teach the IL CCL Class. We go well beyond that! We pride ourselves in delivering the best in high-quality firearms training. When you take a class from FSG, you don't just take a class; you become part of the FSG family. We continuously update and improve our training classes and keep in touch with our students regarding important information. We have relationships with the best ranges in the Chicagoland area! Just finished Stan’s Defensive Pistol level 2! Just as in level one, I walked out of class feeling as though I learned skills that I will take with me, practice and build on to become a better shooter! Stan is a wealth of knowledge, engages his students and always find a way of building confidence! I would highly recommend this class to anyone! I am looking forward to Level 3!. Excellent training for all levels. Stan is a well-rounded instructor, and definitely recommend his classes. Looking forward for more training at FSG. Just finished Phase 1 CCL today, great course!! Stan seems to have a real passion for safety and did a great job of conveying the fundamentals of gun safety.